Stylish timbers for any area! A playground border is perfect for use on playgrounds to retain protective surfacing materials, in gardens for landscaping, and in play areas for use as sandboxes. They’re tough but light-weight, and they last a long, long time. Order now in time for fall, and keep your area enclosed with our high-tech plastic borders. We also send end-kits that let you cut a border to any length you need. 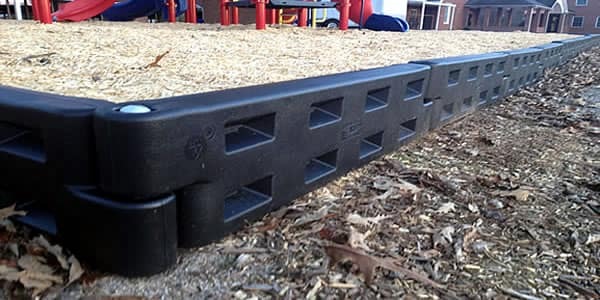 4-Foot, 12-Inch Playground Borders are the most versatile on the market! Each border comes with a metal spike! No additional cost! Playground Plastic borders are a great way to create visually distinctive borders for landscaping, playground materials, and other types of surfacing. Our border timbers have no splinters (unlike wood) or preservative chemicals. They’re easy to install — you don’t need any expertise or special tools to put them in. Our black borders are manufactured from 100% recycled plastic. Plastic borders with a length of 4 feet and a height of 12 inches are readily available in black and green. You can special-order border timbers of other colors. Please note that other colors are considered special production runs and may require more time to manufacture. Fitting plastic borders together is easy. The ends of the border sections overlap, and they are fastened in place with a galvanized spike. Just line the borders up where you want them to go, drive the spike into the ground using a mallet or sledgehammer, and your job is done. These borders are manufactured from polyethylene, and they have ribs molded-in for strength. This design makes them very sturdy. The plastic borders are hollow, not solid, weighing only 9 lbs. Our company uses these borders in its own commercial jobs. Length: 52 inches (4 feet, 4 inches). But for measuring purposes, the timber is an exact 4′ long, since each one overlaps with the next. Width: 4 inches. Height: 12 inches. Note: These timbers are shipped from the manufacturer to anywhere in the USA. Other colors start at $48.99 per unit (price includes spike). Pick Up Black Borders from Our Warehouse Today! There’s no freight charge for pick up! If you are located in the Maryland – DC – Virginia area, you can pick up plastic borders at our facility, for the pick-up price shown by the airplane in the section above.†For your information, our pricing includes the vertical spike with each plastic border (1 per border) but does not include shipping. Please note that any seasonal discounts shown on this website apply to plastic borders that we ship out, not the borders sold at our facility in Maryland. Please also note that the design of the borders may be slightly different than the designs shown above in photographs. Bulk purchases of 20+ borders may be eligible for bulk discounts. Our plastic borders are made from roto-molded plastic. They’re sturdy, but they’re not flexible. If you’re working on a project with very specific dimensions, you can order our Adjustable End Piece. This is a “skeleton” mini-border section that can be slid into a regular plastic border. It lets you trim a border to a specific length. To install an End Piece, you cut an existing border section vertically to the length you need. Then, you slide in the End Piece. And presto change-o, you have a border section that will fit snugly into the remaining space you have in your project. 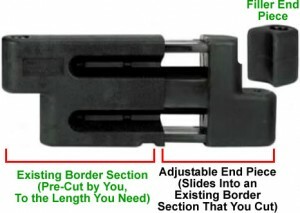 Pricing: $149 for two (2) adjustable end pieces. Note: These pieces are not sold separately. Our plastic border timbers overlap and attach together using vertical steel spikes. But if you’re using the borders to create a straight line that does not meet up with another border section, you can fill in the small gap at the end of each border using a separate piece known as a “filler end.” These are small, hollow blocks of plastic that are molded to the dimensions of the opening at the end of the border. They’re available for borders in heights of 8″, 9″, and 12″. Pricing: $90.00 for a set of six (6) Filler Ends. Note: These pieces are not sold separately. Watch our video on Playground Plastic Borders! Contact us today for estimates on buying plastic borders o or if you have any questions! (If you'd like to fill out a detailed Estimate Request Form, just click here). Our parent company is MD Materials Playgrounds, an American commercial playground equipment seller and installer. MD Materials Playgrounds has been in business since 1986. We pride ourselves on excellent customer service and supporting our local community. See our company policies here.